It was Wednesday, October 24, 1770. The place was Boston, Massachusetts. 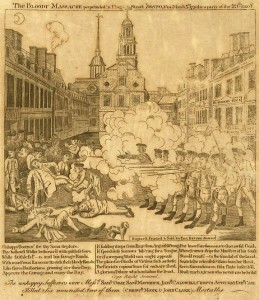 British Captain Thomas Preston was about to go on trial, charged with issuing the order to fire that resulted in five deaths in what became known as the Boston Massacre. He was defended by John Adams and Josiah Quincy Jr., while the prosecution team consisted of Samuel Quincy (older brother of defense lawyer Josiah) and Robert Treat Paine. It was an odd case in many ways. The Loyalists didn’t want Preston prosecuted at all, but they did so in the name of the Crown. The Patriots wanted Preston convicted of murder, but they defended him vigorously in what they hoped would showcase colonial justice. But that entertainment could come at the price of being dragged in as a juror, even if the person might otherwise be excused. An 1818 North Carolina case saw a port commissioner — who would have been excused from regular jury service — denied an exemption where he was snagged as a talesman. The court held that “in as much as no one can be summoned as a Talesman, except a by-stander at the court, no inconvenience can result to the community from compelling a person to serve in that capacity; for the very fact of his being a by-stander proves, that he has not then any official or professional engagements, which require his attention.”14 In other words, if he hadn’t been lollygagging around the courthouse and been doing his job, he’d have been excused. So if your ancestor shows up in a court record as a talesman, in the early years, chances are he was hanging around the courthouse when the sheriff came looking for jurors. In later years, he may have been rounded up from the general community when the well of potential jurors ran dry. Just look at it this way… won’t your descendants have fun with your talesman service record? I don’t know where you come up with ideas for posts, but they’re good ones. I was called for jury duty last summer and although that days jury pool numbered about 45 people, by the time they finally seated 12 jurors and two alternates there were only five of us left. I remember thinking to myself they may have to go out in the hall and grab some “volunteers”. Now I found out it CAN be done. WOW! It absolutely can be done — and is done! Thank you for this, yet another fascinating post, fun to read!